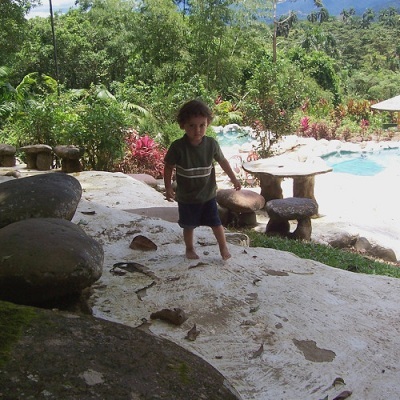 You can travel Ecuador with your kids. And it can be a great adventure for them. 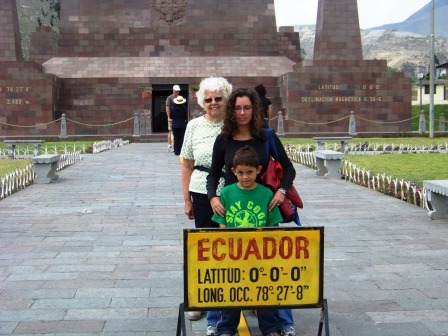 When we originally moved to Ecuador my parents had four kids in tow. Ages: 15, 13, 11, and 4. We had a blast! There are lots of cool things to see and do that will be fun for adults and kids. The beach is always fun for a kid-just find out if your beach has sting rays in the shallow water and ask about rip tides. The rafting tours that are available often have family friendly trips. My two older brothers and I started rafting in Tena a year after we got to Ecuador. Tena's great for water lovers. Tena is also great place for jungle tours. What kid wouldn't like sleeping in a tree house in jungle? 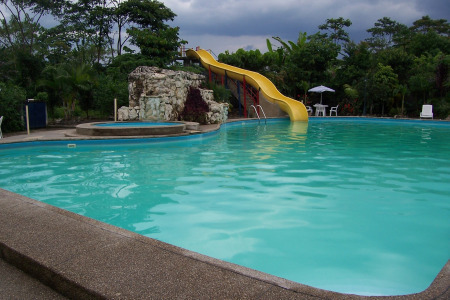 As kids, we loved going to Baños and hanging out in the pools. 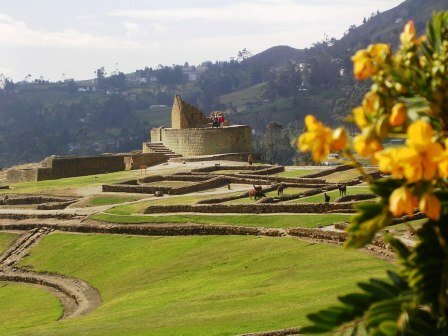 Baños also has great options like bike riding, hiking and live cultural shows with music and dancing. Recently we rented go-karts in Baños...which was awesome for my teenage brother. If your kids are getting sick of "good" food, you can even bring them a taste of home.....Quito and Guayaquil have McDonald's and other common food chains. If your kids are really daring, check out the traveling carnivals found throughout the country. They have crazy rides. Some are run on pure man power and look like something from last century. Using a stroller isn't always easy. Streets and sidewalks can be very bumpy. But because of the amount of walking, you'll be glad to have something to cart them around in. No one uses car seats in Ecuador. So we brought our own. We buy the little guy his own seat on the bus and strap him in. Baby necessities like diapers and wipes are easy to come by, but places to change them aren't so easy. Don't worry; no one will look at you funny for choosing an odd spot to change a diaper or breast feed, it's a normal part of life in Ecuador. Kids meals don't really exist at restaurants. But many restaurants are happy to accommodate an "à la carte" request. Parks for kids are around. Just check things over for safety issues before cutting them loose. For older kids, parents should know that laws on selling alcohol and tobacco to minors are not enforced. So you can send your kid to the store to buy you a beer -which might be cool for you- but there will be no one to stop him from drinking one as well. If you plan to travel Ecuador with kids on your own, you may want to get written permission from the child's other parent. Technically by law you shouldn't need this if you stay 90 days or less in Ecuador. If your child does not have an Ecuadorian passport see note below. If you stay more than 90 days you may have problems when leaving the country. This is due to international kidnapping laws. So it is for your child's protection, but it can be annoying when you're just trying to go home. I've experienced this myself as has one of my friends. In both cases the fathers of these children were already in the United States and we were traveling to meet them. Immigration at the Quito airport demanded written permission to take the child out of the country. In my case, the immigration official was able to verify in her system that my husband was currently in the States. But even then she said she could get in trouble if my son's GRANDPARENTS were to make a fuss about him leaving. Both my friend and I were able to leave with our kids. I had to start crying, but we were allowed to leave. To avoid problems you need a letter giving your permission to leave Ecuador with your kids. The letter should be signed by both parents and notarized. The letter doesn't need to be anything special. The notary office in Ecuador tried to make us believe that we needed a lawyer to draw up the permission paper. But my quick and to the point letter, notarized and signed by my husband and I was all Immigration needed. It would be good to have it written up in Spanish. 2014 Update: The Ecuadorian law has changed and you do need a document written up by a lawyer now. We were able to have this done at the notary office. A friend of mine called the US Embassy and they told her the law applies only to children who are Ecuadorian citizens (including dual citizens), but that they have no control over what immigration will do. If you child is NOT Ecuadorian, make this clear if you face any problems leaving the country and you should be ok.